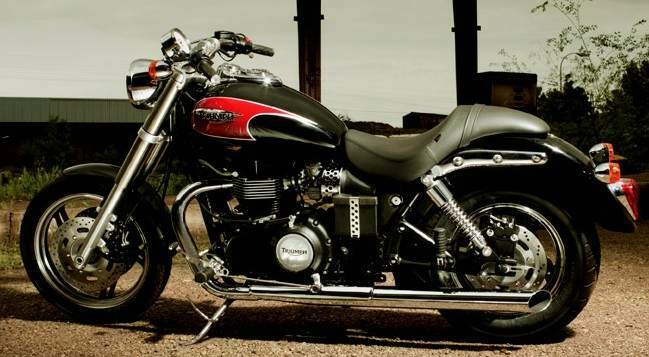 With the Triumph Speedmaster, the English manufacturer sees its way through in the acclaimed class of middleweight cruisers, dominated generally by American and Japanese builders. Implicit, it brings a fresh feel and brakes the rules by simply choosing not to have a V-twin engine. Some love it for that, and others actually say that they don’t consider it a cruiser, but everybody finds it exquisite. Furthermore, by combining the very essence of an old-school street-rod, the Triumph Speedmaster can’t be confused with anything else out there. 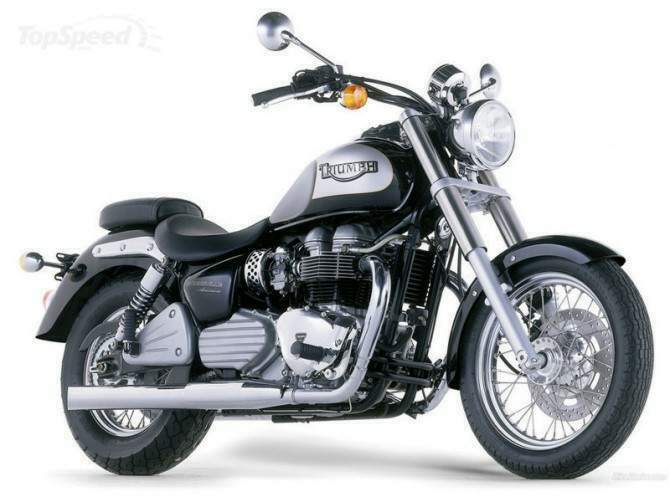 Triumph found a wise way of introducing the Speedmaster in 2003 because it first tested the market with the Bonneville America a year later. This bike, at the time, had a 790cc engine and 270 degree firing interval. As a result of the bike’s success, Triumph decided to base their future cruiser’s main features (engine, transmission, and chassis) on it and create what was known as the sleekest, smoothest, and most beautiful cruiser that Triumph has ever built until the time. The Speedmaster was kept the same for 2004 model year without even the smallest changes, like colors or finishing touches. 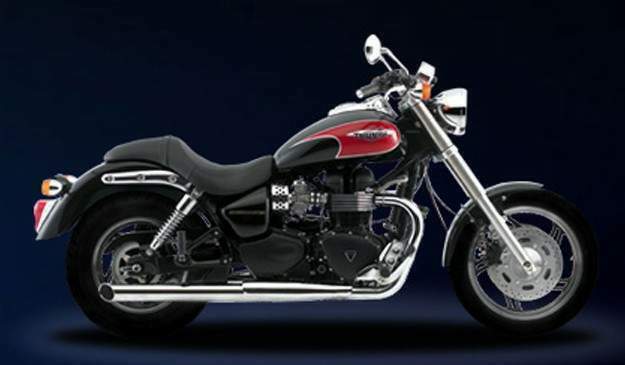 In 2005, the Triumph Speedmaster suffered a displacement increase. The 790cc parallel twin was now featuring 865ccs and the motorcycling public was more than happy with the change. As a result, sales increased significantly and the bike’s popularity soon grow, leaving the competition surprised and willing to make an effort so that Triumph’s slice won’t dramatically influence theirs. .If I was to name a single bike that the Speedmaster is competing with, it would definitely be the Harley-Davidson XL883 Sportster. Both manufacturers have a solid background with ups and downs on each side, but their products didn’t manage to disappoint ever. The Sportster’s agility is due to its small mass and the 883cc Evolution engine with rubber mounts, but its aggressive looks and the strong heritage are the ones that practically sell this baby. The 2008 V Star 1100 Custom promises to be a big hit thanks to its 65-cubic-inch air-cooled 75 degree V-twin; SOHC, 2 valves/cylinder engine. Although Star motorcycles are seen for just a couple of years, Yamaha (which is the initial manufacturer of those very same models) has passed on the experience it gained during manufacturing its cruisers, which later went on and were named Star Motorcycles. So you can be confident that this Star is suitable for the battle with these two lightweight monsters. Even more appropriate, thanks to its looks and cylinder capacity, is the Kawasaki Vulcan 900, one of the most strongly customized motorcycle at Kawasaki’s. Having a lot of grunt coming from its 903cc liquid-cooled, SOHC, 4-valve cylinder head, V-twin, this is the closest bike you’ll find competing with the Triumph and one that doesn’t come from the land of all possibilities. Now don’t get me wrong…the Sportster does rule. Triumph likes keeping things nice and balanced when it comes to their Speedmaster so you’ll find on side of the bike looking exactly like the other (I know what you’re saying right now…but the Scrambler is a whole other business). Even though the parallel twin kind of betrays it when it comes to looks, Triumph keeps it black-coated leaving just the cooling fins to make a statement. The chromed exhaust pipes, one on each side, clearly individualize the Speedmaster considering that the rest of the crowd prefers going with a right side exhaust. Massiveness is the key and this bike clearly has it. I mean…what do you want me to start with? Do the 41mm front forks look cool or you’ll rather go with the wide 4.4 gallons tank? There’s one thing I know. The five-spoke alloy front wheel gives the tone and every single element proceeds continuing what this unit started. The round headlight as well as the tachometer and mirrors give it a bad boy look, not to mention what I know you like best, the slightly leaned back handlebars and fuel tank. Wide seats are always appropriate for these kinds of bikes and Triumph didn’t miss this very important aspect. In fact, the one-piece seat looks awesome, but I’m just wondering how your passenger will sit on it. At the end, the rear fender looks more classic than custom, but we have to understand the fact that designers tried to make it look like its braking the land speed record even when it isn’t even moving and the rear end is a consequence of that successful attempt. It looks awesome no matter what color or color combination you choose (Phantom Black, Phantom Black/Tornado Red, or Pacific Blue/Aluminum Silver). The Triumph Speedmaster is a bike that looks inviting and truly able to give you one hell of a ride as soon as you jump on it. I did so and the bike amazed me within the first half on hour. It is that great! Why? Let me start with the riding position. Obviously, this is given by the three elements (seat, handlebars, and footpegs) which, thanks to their arrangement would seem a bit uncomfortable. The handlebars don’t seem at quick reach and the footpegs are mounted forward, but this would have been no custom bike if things had gone any other way. I found the riding position very adequate for me and the seat was perfectly balanced between soft and firm which means great comfort from start to finish. But this won’t be a drag race, even though the bike is packed with muscle and full of abilities. You will surely enjoy revving the 865cc parallel-twin in every single gear and the feedback will be as powerful as expected from such a bike. It feels excellent between 4000 and 7000rpm, but the most amount of torque is delivered from under 3000rpm. Believe me, it feels! Low and mid grunt are well at home on the Speedmaster, making the bike suitable to be ridden on any kinds of roads. It doesn’t pass unnoticed while rumbling quietly down the boulevard and kids in mom mobiles will definitely smile and flip their hands at you. The thing is that if they blink, they’ll miss you. The engine is torquey and doesn’t necessarily ask you to shift, feeling wonderful on the twists in third gear. As you may have noticed, I am very pleased with the Speeedmaster’s five-speed gearbox, which is easy to use and bulletproof built. Clutch feel is also positive, smoothness being the whole key. As I rolled down the S-shaped mountain roads, I really felt like I was riding the lightest and most nimble custom bike ever. It is extremely easy to be leaned over and, of course, the throttle gets it up easily. Even with a passenger in the back, I wasn’t needed to make an extra effort as the bike did everything for me. I just had to point the way and hold it steady. This is awesome and you’ll find yourself running low on the second gas of tank easily. Two disc brakes up front and a single rear brake located at the rider’s left side make this motorcycle look like it is ready to rock and here’s the best part…it actually is. Powerful braking is the result of 310mm discs and a 285mm disc, each being cheered with two piston calipers. A down point in my opinion would be the suspensions which don’t quite soak up the bumps as they should and tend to make longer trips harsh for the back. If you had second guesses about the riding position, I would recommend you to give it a try and understand what I am saying. Even so, you won’t have problems eve if you’ll be riding it for approximately 200 miles a day. I believe the numbers are pretty satisfying. No matter what bike we’re talking about, we all know what sells a Triumph. The emotions that this kind of bike awakes are one-of-a-kind and it is all due to the balance between old and new, perfectly achieved by Triumph motorcycles. Even though not old, the Speedmaster still retains the uniqueness, feel, and attitude of the most important English manufacturer ever.